British-born, Irish-bred, bassist, singer, and songwriter. 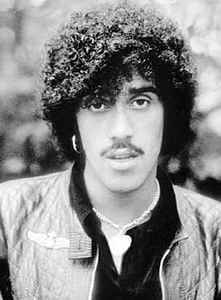 Lynott is best known as the bassist, vocalist, songwriter and front-man of the band, Thin Lizzy. He launched a solo career in 1980, and fronted the band Grand Slam from 1984–1985, before returning to his solo career in late-1985; shortly before his death. Born of an Irish mother (Philomena Lynott) and a British Guiana father (Cecil Parris). He, like many 'rock 'n rollers' of his generation, developed an alcohol and drug dependency which subsequently led to health problems, and a failure to diagnose a long-standing infection caused his sudden collapse on Christmas day, 1985. He finally succumbed to pneumonia and heart failure 10 days later in the intensive care ward of Salisbury Hospital. He is buried in St. Fintan's Cemetery, Sutton, Dublin, Ireland. A life-size, anatomically correct, bronze statue of Lynott was unveiled on Harry Street, off Grafton Street, Dublin, in August 2005. Died: 4th January 1986, Salisbury Hospital, Salisbury, Wiltshire, England [heart failure, aged 36].